On Tuesday March 19, 2013, approximately 350 Ontario taxpayers gathered at the steps of the provincial legislature to demand that MPPs delist abortion from the list of insured services covered by Ontario's Health Insurance Plan (OHIP). This rally is part of a provincial campaign that CLC's Youth division has been running since 2011. These individuals made the sacrifice to come to Queen's Park on a work day, or in the case of youth, a school day, and send a message to all the MPPs who were inside the legislature building: DON'T USE MY TAX DOLLARS TO PAY FOR SOMEONE ELSE'S ELECTIVE ABORTION! They braved blizzard conditions to get to Toronto from as far as Sudbury, Walkerton, Peterborough, Chatham and Cambridge. The crowd was loud and enthusiastic, often breaking out into spontaneous "Defund Abortion" chants as one guest speaker after another made powerful arguments against forcing taxpayers to fund medically unnecessary abortions. Rally speakers explained that the money being diverted to pay for abortions, is at the expense of genuine areas of health care, such as fixing Ontario's doctor and nurse shortages. During the event, a Liberal MPP from the riding of Ajax-Pickering, Mr. Joe Dickson, came forward to receive a Defund Abortion petition signed by 560 of his constituents. 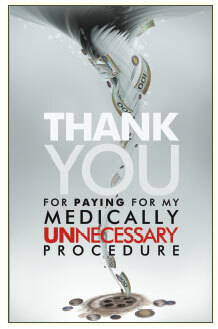 The MPP said a few encouraging words to the concerned taxpayers and told them to "Keep up the good work". A federal Conservative MP, Garry Breitkreuz (Yorkton-Melville), wanted to attend the rally in person but was not able to do so. Instead, rally organizers read out a personal message from MP Breitkreuz in which he encouraged prolifers to keep working until abortion is defunded in Ontario. Immediately after the rally, nearly 25,000 petition signatures were handed in to other MPPs at Queen's Park. Below are videos and photo albums from Ontario's 2013 Defund Abortion Rally. Given the fact that the CBC, the Toronto Star, Globe & Mail, CTV and Global TV have full time offices inside the walls of Queen's Park, it is somewhat astounding that they could not step a few feet outside their doors to report on the Defund Abortion Rally. We were literally on their doorstop. Of course, CLC sent out press releases about the event, but as so often happens to the pro-life message, it was censored by the mainstream media who is heavily biased in favour of so-called "abortion rights". Defunding abortion is not a movement they wish the people of Ontario to learn about. 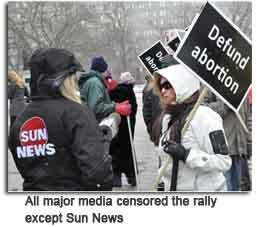 The only media that reported on the rally were Sun News Network, LifeSiteNews.com, The Interim newspaper and The Catholic Register. Nonetheless, MPPs knew we were there and got the message loud and clear. On a more positive note, leading up to the rally CLC representatives were interviewed quite in-depth about the issue of defunding on AM 640's John Oakley Show and 1010 CFRB's Jerry Agar Show. If you've never met in person with your local MPP to discuss removing abortion from the list of services covered by OHIP, please book an appointment now. If you've done this already, please take advantage of current news stories that touch upon the scarcity of health care dollars, as an excuse to visit the MPP again. For example, from time to time, a report will come out stating that Ontario nurses are burned out due to the ongoing nurse shortage. Each time such an article appears - there is your excuse to book another appointment! Other stories that surface fairly regularly include accounts of expensive drug therapies or surgical interventions that were not covered by OHIP. Be persistent. Keep bringing these stories to the attention of your MPP and pointing out that every dollar diverted to pay for elective abortion as a back-up birth control method, is a dollar diverted away from cash-starved areas of genuine medical need. If you're unable to visit in person, send a copy of the article with a personal letter. This can help get new people interested in the campaign, or serve as an excuse to bring up the issue in conversation. Our pamphlet was strategically designed to get people thinking about where their hard-earned money is going. We usually recommend doing the blitz in a neighbourhood near the MPP's office because it is likely to come to their attention that way. The growth of this movement will be facilitated by the greater participation of religious leaders. Numbers at the annual rally will ramp-up when pastors challenge their congregation to come along with them. But the obstacle is that religious leaders are often too busy to learn about initiatives like this. You can help by sharing our detailed Defund Abortion brochure with your pastor, and then pointing out a couple of the key arguments, along with a request to get their church involved the next time. That makes it easier to keep you abreast of new developments. If you live outside of Ontario and would like to talk with us about starting a Defund Abortion campaign in your province, please contact MarieClaire, 1-800-730-5358 ext. 250.